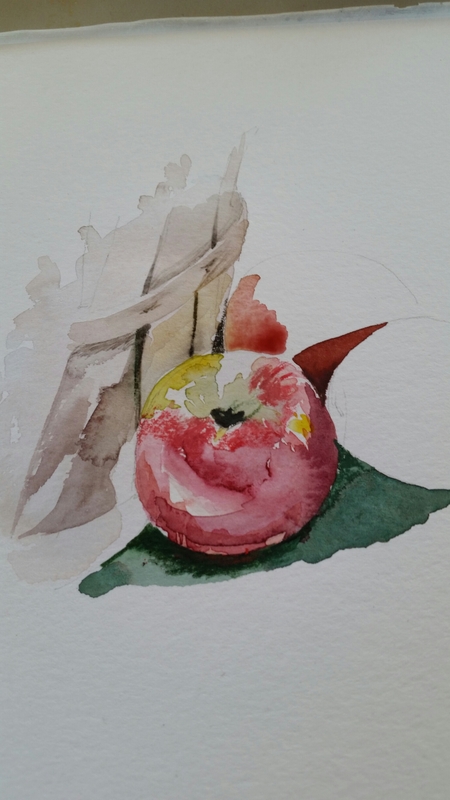 Working from my phone is a clumsy affair, but I have loved reading blog posts from my favorite people, and couldn’t resist sharing this post – Christmas moment of my own watercolor serenity. I’ve been encountering some problems with out-of-focus images lately on my blog posts, so now I’m experimenting to see if I can solve the problem. I’m posting this in hopes that it is clearer. When a tempera is finished, he hangs it in his house to see it in all moods, all lights, accidentally out of the corner of his eye. I think the fatigue factor has finally kicked in. 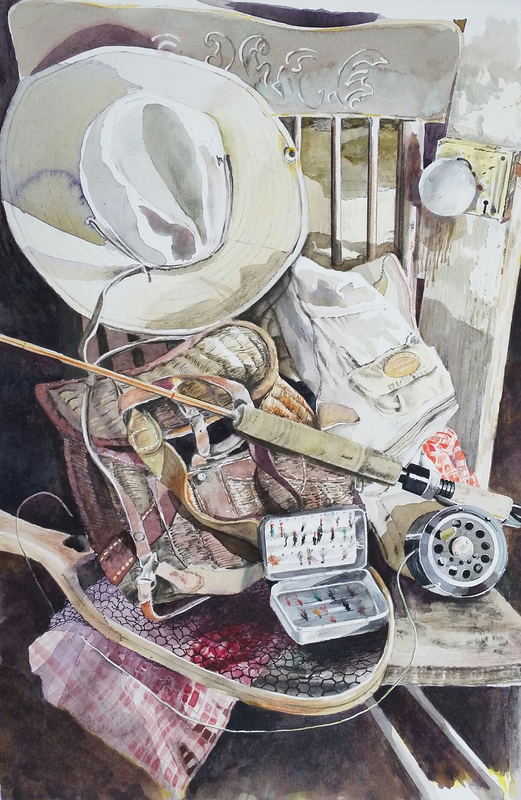 I speak not only of having a good night’s sleep interrupted, but also of the reality that I am getting tired of looking at this watercolor (and am surprised that some of my readers actually say they like seeing this, over and over, on this blog). Over the past several days, I have added small, tweaking details to this painting, and I have screwed up many a painting doing exactly this–just not letting it go. So . . . I’ve decided to give it the Andrew Wyeth test, and will let the painting sit in my home where I can go in and out of the room, glancing at it occasionally, sitting and studying it from time to time, perhaps making some notes, and knowing that maybe nothing else needs to be added except my signature. To say that I have enjoyed working on this from conception to finish is a gross understatement. 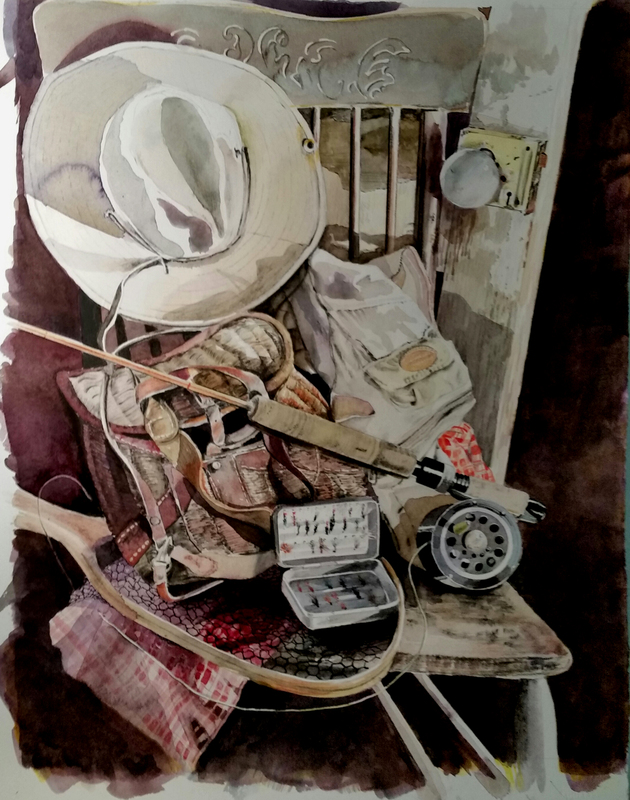 The deepest satisfaction has been spent in company with this watercolor coming to term. And I’m grateful for every positive comment I’ve received from viewers over the past several weeks as it has grown. At 5:44 a.m., an unspeakably cruel dream shattered the darkness of my deepest sleep. And the debris of that wretched visitation disallowed any chance of returning to sleep this morning. There was no one I dared call in the pre-dawn–I would call that a genuine test of friendship, and I didn’t want to put anyone to that sort of test. Turning to my bedside table, I found the kind of companionship that will not be tied to a clock, beginning with Robert Frost. I realized that each tick of that clock was the sound of a footstep walking away in the night, never to return. Time leaves us behind. Thinking on that led me to the realization that life is too brief to dwell on the demons of the night. I was too awake to return to sleep, so I declared myself rested and determined to make this day a good one, or to quote from the bard Thoreau: “to affect the quality of the day.” There was a still life waiting in the garage, and tools ready for my return. Looking up at the window, I saw the grey light of dawn breaking through, and took that as an invitation to follow my bliss, and I shall. I blog as a reminder that I’m never really alone. 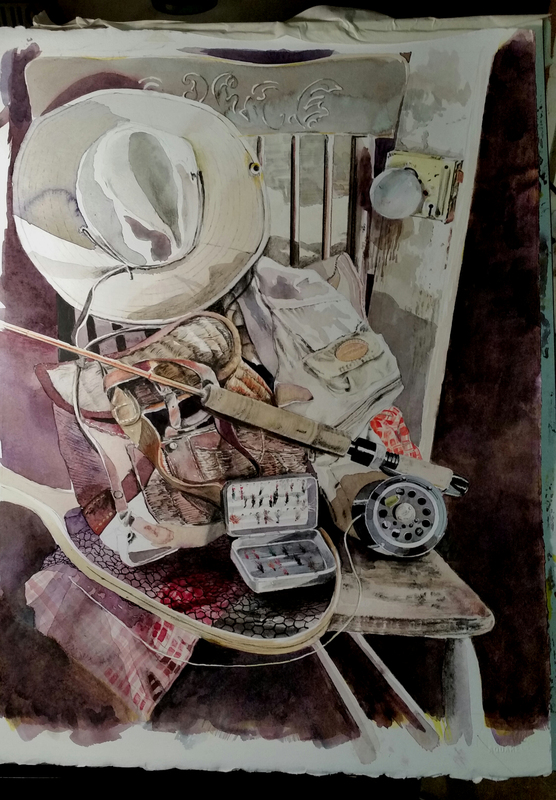 Last night, after hours of reading, I went into my garage and tinkered with this still life until about 2 a.m. Sleeping in this morning, I had some moments with the painting from 11:00-noon, but was suddenly interrupted with some necessary business errands. Returning late in the afternoon, I resume some serious work on the door behind the chair spokes, as well as the edge of the door. I’m still trying to figure out the background, thininking I would like it to be darker still. So, I’m not yet calling the work finished, but believe the end is not far away. I was learning from the painting of Cezanne that made writing simple true sentences far from enough to make the stories have the dimensions that I was trying to put in them. I was learning very much from him but I was not articulate enough to explain it to anyone. I cannot explain the deep-seated satisfaction I’m drawing from my second reading of Hemingway’s A Moveable Feast. I don’t remember how I got alerted to reading this book a couple of winters ago, but am so glad it’s come across my threshold. This book was published posthumously, and contains Hemingway’s manuscript written while in Paris from 1921-1926. He was contacted by the management of the Ritz Hotel in Paris in November 1956 to take possession of two small trunks he had left behind there since March 1928. The contents of the trunks contained this manuscript. I laugh when I read the quote I’ve posted above, especially the final sentence. He certainly was not able to get across his theory to me, the reader. Perhaps this is why I still haven’t published my own theory of aesthetics–I don’t quite know how to put it into words because I sitll don’t know quite what it is. Nevertheless, I did manage to get in some quality studio time tonight and am anticipating more opportunity tomorrow. I would like to finish this before Christmas arrives, though I have no deadline for it–I’m painting it for my own pleasure, not for a commission. And I still have so much to learn as I wrestle with this composition. Tonight I worked exclusively on the left-hand portion of the painting, trying to darken the values. I still don’t have any of it as dark as I wish, God knows how I struggle to darken watercolor, adding wash after wash of warm and cool colors alternately. Eventually I’ll get there, I hope. The grizzled teacher slowly woke from his late afternoon December nap, felt the winter chill filling the bedroom and decided to pull on warm clothes, draw the quilts up over his lap and prop in his bed with a pile of books and a fresh pot of coffee at his elbow. It was the first evening of Christmas break, a two-week holiday from high school classes. As he gazed across his room at the volumes on the bookcase inviting him into the spring term of classes–DeKooning, Motherwell, Rothko, Pollock, Picasso, Matisse, Hemingway, Fitzgerald, Joyce, Pound, Eliot and William Carlos Williams–he felt a stirring of contenment under his skin much like the spring thaw bursting through the winter rocks. He opened his first book and began . . . Thanks for reading. I’ll probably post more later . . .
By now, readers may be weary of seeing this . . .
After writing a story I was always empty and both sad and happy, as though I had made love, and I was sure this was a very good story although I would not know truly how good until I read it over the next day. 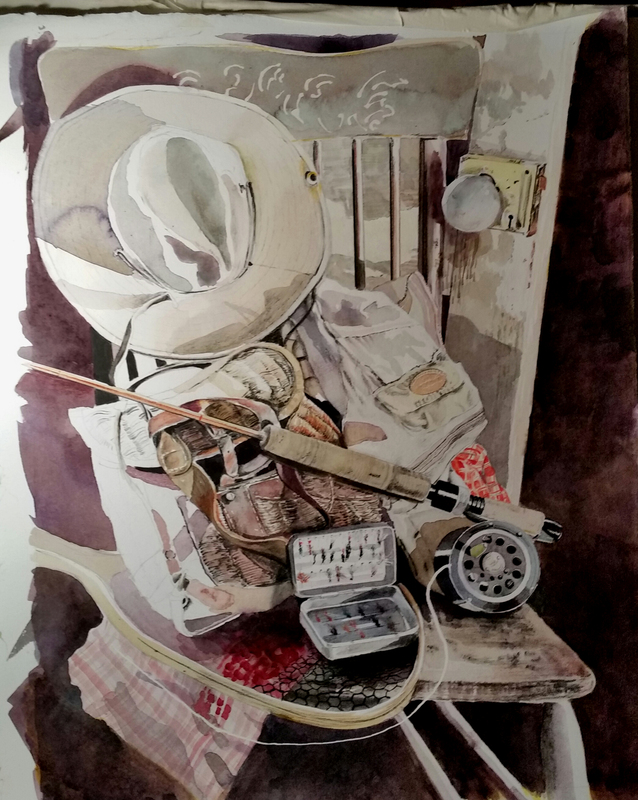 My work on the above still life is slowing considerably, as I try to decide how to finish it. Last night I attended a Salon which is a monthly “meeting of the minds”–a group I enjoy very much. 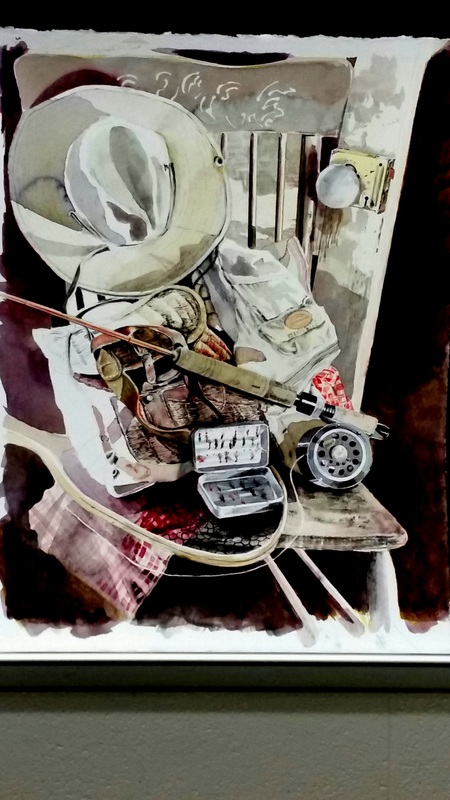 When I got home it was rather late and though I worked more in the shadows of this watercolor and did a little detailing, for the most part I stared at it, took a picture and posted it into a draft and went to bed. Now, in the midst of the first day of final exams for my high school, I am looking at it some more, and attempting to put a few thoughts on the page . . .
As we draw closer to Christmas, I am filled with comingled emotions of sad and happy. Many sad memories from my past linger over the Christmas holidays, but at the same time, students have a way of filling the atmosphere with good will. I’ve received a number of surprise gifts and treats this week that always lift my spirits. But today, I found in my faculty mailbox a gratitude/tribute letter from a student of philosophy from last year. It made me cry. I could not stop, had to find a private place and just let it flow. I’m always blindsided when a student writes this kind of a beautiful, loving letter of appreciation for the difference I made in the classroom in this one’s private life and outlook. I never know about these matters, unless someone tells me, or writes me. This letter is now taped into my Journal so I can return to it as often as I need, and I will probably need to do just that over the holidays. My gratitude now is boundless. On a parallel note, college student have been pouring into my classroom during lunch and after school for several days now, overflowing with their semester adventures and stories. I can never get enough, when they tell me what they’re reading now, what kind of art they’re creating, what they’re thinking. I never want them to leave, the moment is so sacred. A couple of days ago, I didn’t leave school till 4:45 (my last class finishes at 12:20), when the last college student left. O.K., returning to my painting and the Hemingway quote above: I know exactly the emotion he described, because when I close in on the finish of a painting, I have those conflicting sentiments of satisfaction for the accomplishment along with melancholy over wondering what to do next. That is precisely why I used to keep several watercolors in progress at the same time, so I was never at a loss of what to do next when a painting was finished. When I get home today, I plan to go back to the bins to see what I have started and not finished. No doubt there are plenty of pieces abandoned from recent months/years. If not, then I will begin anew before I retire to bed, so that I can be certain that I won’t be caught with those post-creation blues once the still life above is finished and signed.
. . . a memory or even a state of being that had become a part of you, a thing that you could have always with you, no matter where you went or how you lived forever after, that you could never lose. Feeling like Hemingway in the cafe on the Place St.-Michel in the winter of 1921 Paris, I am seated in the back of my chilly classroom this morning, huddled in my leather billings jacket, drinking coffee and re-reading portions of Hemingway’s A Moveable Feast that I only discovered a winter or two ago. It’s the last official day of school, and though we will have two successive mornings of final exams, the classes will be abbreviated, and students will clear the building before noon. Little-to-no interaction will transpire the next two mornings; today is the “Merry Christmas” and “Seasons Greetings” kind of day that fills all of us with a sense of good will with the approaching holidays. This morning, students are tutoring and studying for their impending finals, food has been brought in and everyone is upbeat. As for me, I’m grateful for the “moveable feast” moments in my life that always embrace me warmly as Christmas approaches and good will fills our atmosphere. I brought my watercolor to class, knowing there would be plenty of space to tinker with it. 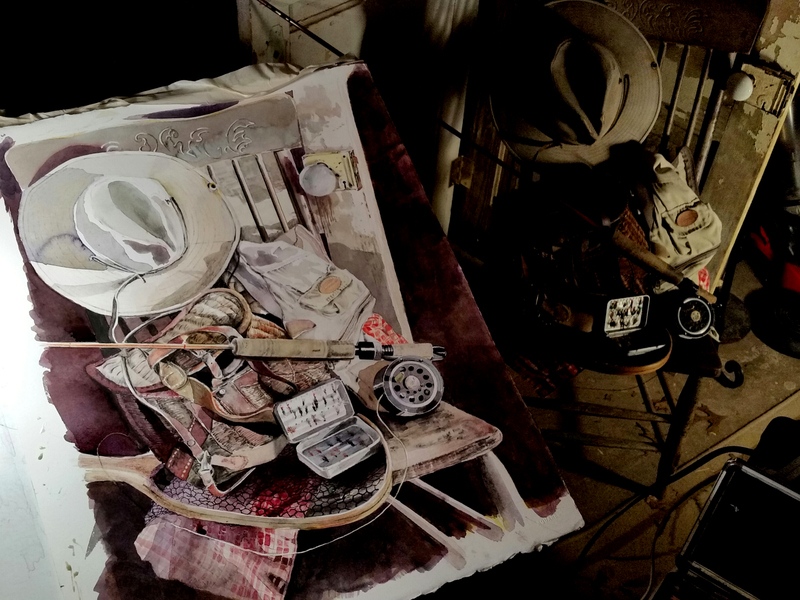 Thanks to a desktop computer, I can look at photos of the garage still life on my monitor as I set up this watercolor across the room on the chalkboard tray and look at it, making critical notes of how to fine-tune the composition as it gets closer to its finish. Already today I have done plenty of small detail corrections and adjustments, and I am getting drawn in closer and closer to these objects and all the memories associated with them. And of course, reading Hemingway’s early cafe writings is flooding me with a sense of warmth and meaning, despite the cold, dark climate we’re experiencing outside. 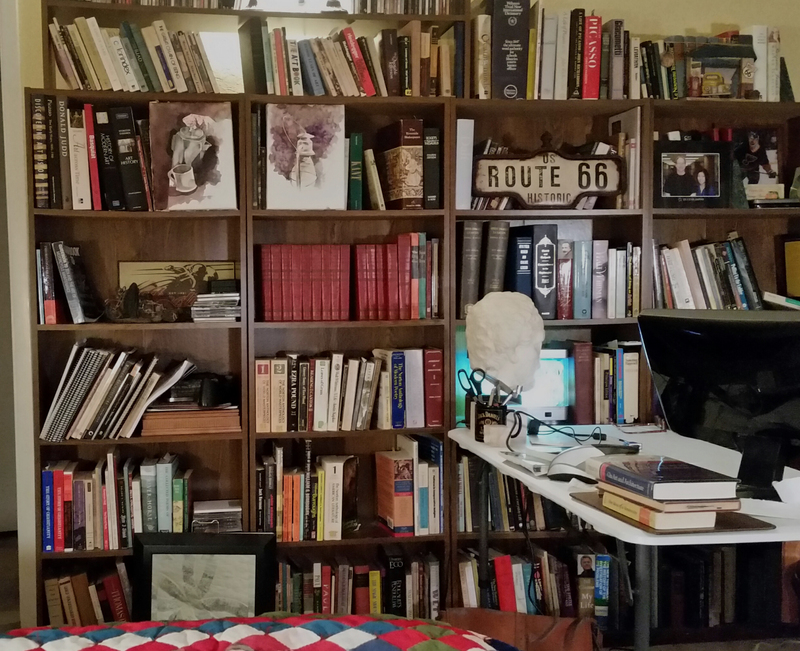 I walked out of my studio early last evening, because I was seized with the desire to sit for a few hours in quiet with books, my journal and my thoughts. It was the best possible way I could have passed the evening. I knew when I left the studio that I would have no trouble returning, because the part of the composition I was working on was “hot” and I knew exactly where to resume when I returned to it. As I spent the remainder of the last evening pondering, writing, pondering and writing some more, I had no inkling of how serendepitous the following day would be . . .
Before going to school this morning, I was digging through a pile of debris in one of my neglected closet spaces and came across a DVD I had missplaced over a year ago–Woody Allen’s Midnight in Paris. At my first opportunity today, I replayed the film, and revisited with exquisite pleasure those memorable clips of Hemingway, Fitzgerald, Picasso and Dali in 1920’s Paris. 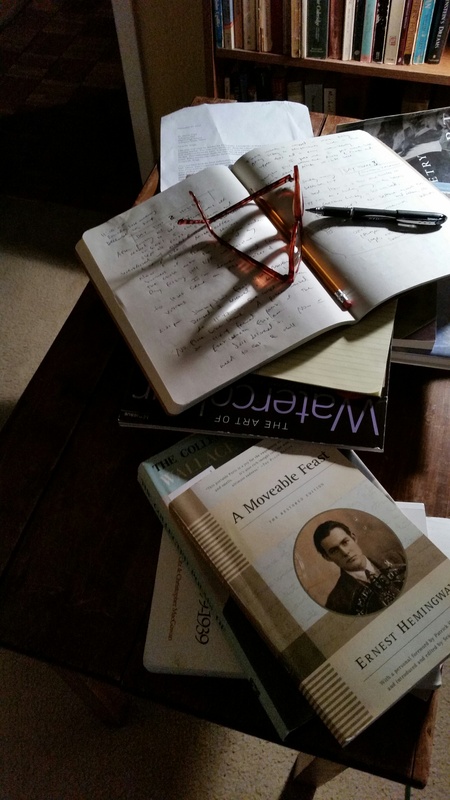 Throughout the day, the sweetness of some of the words of Hemingway I had read over the past couple of years remained with me, and I’ve posted them above to open this blog. 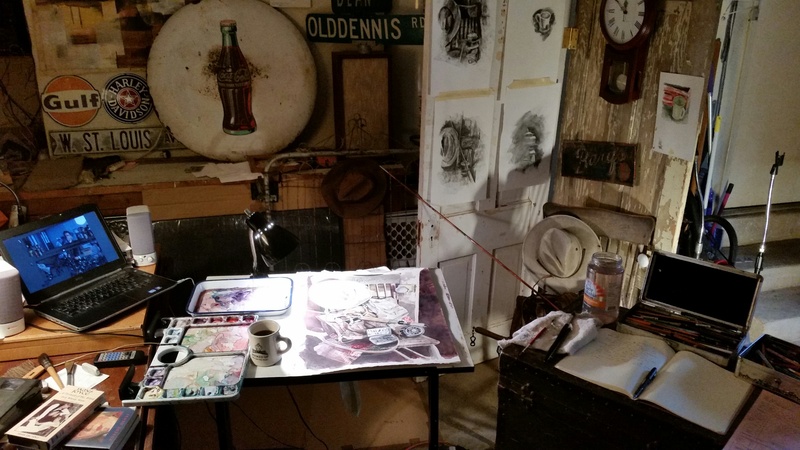 When I returned to the studio this evening, those haunting words surged through my consciousness as my watercolor brush and pencils turned into knives with which I cut through the fog of self-doubt and fear and rendered the objects before me with all the skill and confidence I could muster. I remembered the days long, long ago, when I worked at an industrial site to support myself and my family during graduate school. Knowing that I was cutting stainless steel that was then priced at about $2.48 a pound (one of the shipments I was assigned to cut to proper sizes cost the company around $330,000), I was told by my supervisor–“measure twice, cut once.” Tonight as I worked on my still life details, I thought: “Look three times, stroke once.” Indeed, I spent more time tonight looking and re-looking than actually painting, but when I did touch the paper surface, I drew and painted with confidence, and now finally, this painting is moving in the direction I wish it to go. Thanks, Ernest. 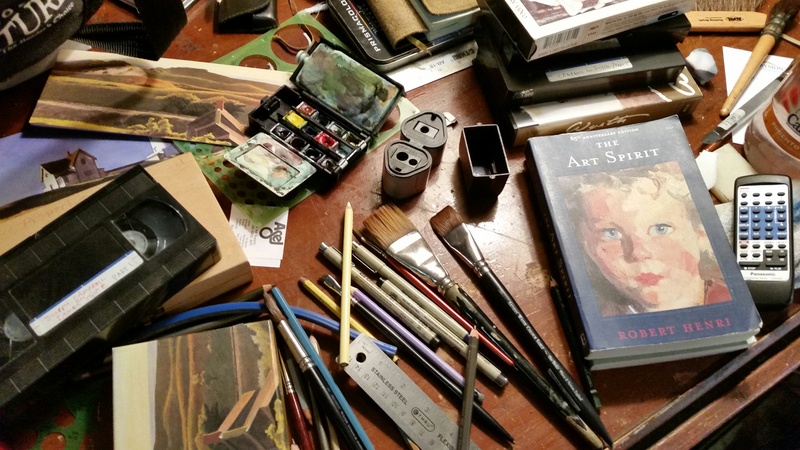 As I size up my still life composition, I realize that are no magic tricks at work here. All I need to do is look at the objects as steadily as the ancient Greeks looked at life (Matthew Arnold wrote that they “saw life steadily, and saw it whole”), and move my brushes and pencils in the corresponding patterns my eye discerns. Perhaps by so doing, my prosaic work would one day turn poetic. We’ll see. But in the meantime, I feel no fear, and am truly enjoying this adventure in the studio.